I came across this book excerpt that gives a flavor for the life of the Wasserreich family in Montevideo in the 1940s. The author Eva Ross was born in Austria as Eva Stoessl. The uncle David she describes below had the surname Stossl, which is the married name of Erich Wasserreich's daughter. On weekends in the summer we would go to the beach; if my uncles picked us up in their car we would go to Carrasco, a nicer and more exclusive beach. We could also take the bus, but they were always terribly crowded and we had to stand the whole way for 30 minutes. Coming back in the evening it was even worse; people would hang like grapes from the bus. Nevertheless, Montevideo was a city where one could live quite well without a lot of money or a car. The transit system was very good, going from east to west and south to north, but often overloaded. One could stay on the beach all day without paying a penny, and food was not expensive. My uncle David, who had divorced his first wife with whom he had a son, Ernesto, was dating a very pretty young German refugee by the name of Eva Wasserreich, who had come with her parents from Berlin where her father had been a prosperous businessman. New her father was selling butter from door to door! My uncle’s hobby was horseback riding, and with his factory taking off, he was able to afford a car and to join the equestrian club. He taught Eva to ride also and they went riding every weekend in winter, but in summer they loved to go to the beach. As the club was near Carrasco and the best beach happened to be there as well, we sometimes had the opportunity to get a ride in their car to Carrasco. David and Eva eventually got married and moved into an apartment near her parents. We often had meals together, especially for the Jewish holy days. My uncle would often say to me, a twelve-year-old, “Children should be seen but not heard.” Or, “You keep quiet, you are too young to participate in this discussion.” Such comments did not encourage me to be outgoing. I think I found the final resting place of Erich Wasserreich and his wife and daughter. Wasserreich was the Hermann Ringel business partner who we think acted dishonorably following Hermann's death in 1938. According to Helga Ruby's memory as recorded by Walter in "The Early Lives of Stan and Helga Ruby," Hermann's business partner made off with funds Hermann had hidden away to finance the Ringel family's escape from Germany. In my recent review in Berlin of the aryanization files of the Hermann Ringel & Co. business, I saw several pieces of correspondence from shortly after Hermann's death that show Wasserreich attempting to gain sole ownership of the company. A later letter in the file from a Nazi official reports that Wasserreich had since departed Germany for Montevideo. In all the correspondence, Wasserreich's full name is given as Erich Ignatz Wasserreich. 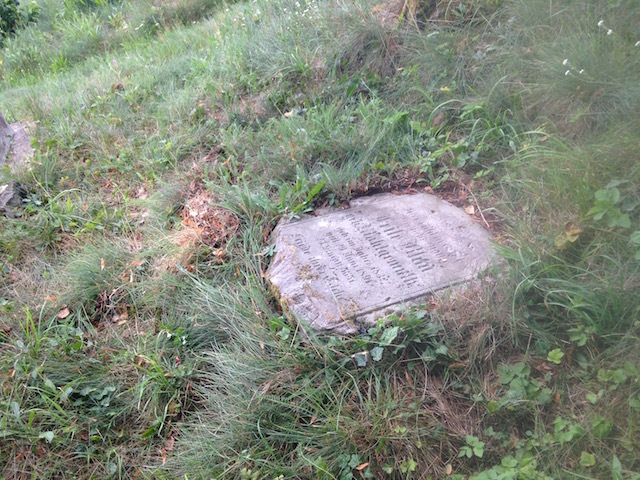 Now here we see a Chajim Ignacy Wasserreich buried in a Montevideo Jewish cemetery on October 5, 1950. Missing is the given name Erich, but the middle name, cemetery location and age all align perfectly what we know of Hermann's deceitful partner. Wasserreich's wife Else (died 1968) and daughter Eva (died 1994) are buried with him. It appears that Eva married and she may have left living children. Not that they would bear any responsibility for Wasserreich's suspected dishonesty, but it would be interesting to see how they are getting along in Uruguay. The burial listing from the Jewish Online Worldwide Burial Registry (JOWBR) is below. Despite my earlier belief that all the Wohlgemuths in Pr. Stargardt were our family members, I have found quite a few people in town with that surname who were not related. 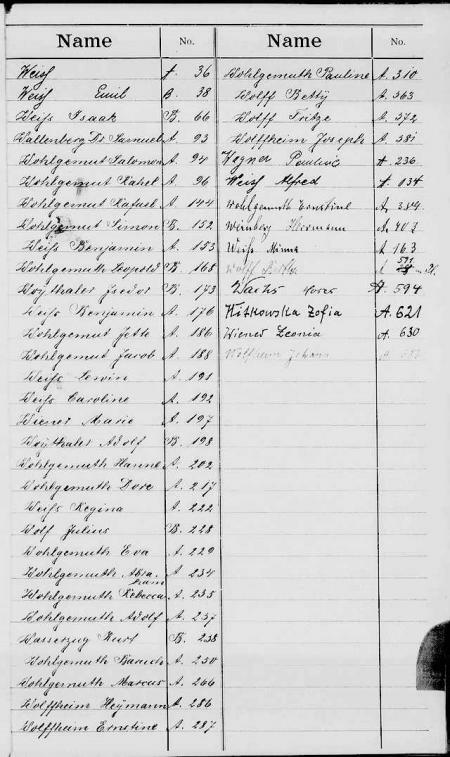 In the Naldex database, we see the name was adopted in at least seven West Prussian towns, some near to Stargardt, and some descendants of these Wohlgemuths also show up in the Stargardt community Jewish records that I have been busily studying. Unfortunately the two Wohlgemuth graves in the Starogard Jewish cemetery, Teile Wohlgemuth Blau and Pauline Weiss Wohlgemuth, are not from our branch. 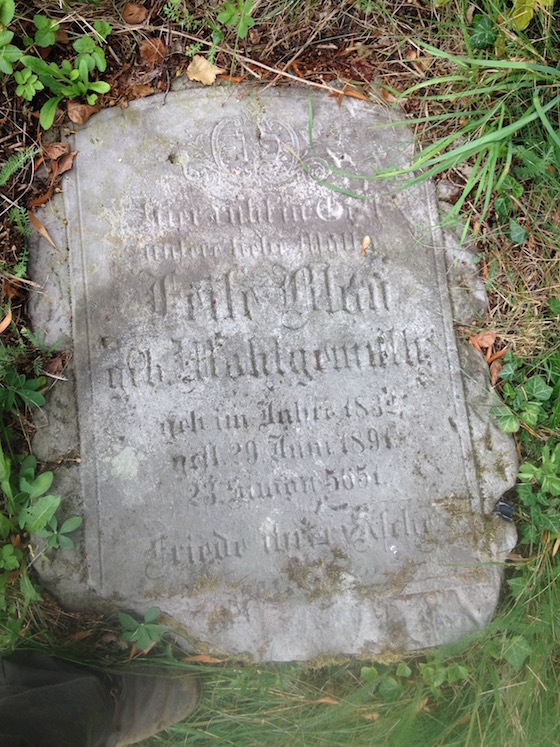 Many of our Wohlgemuth relatives are buried there, but none of their headstones survive. I have spent the last several days extracting Wohlgemuth vital record data from Jewish community logbooks covering the period from 1812 to 1910. They are mainly in hand-scripted German with some Yiddish language records mixed in. 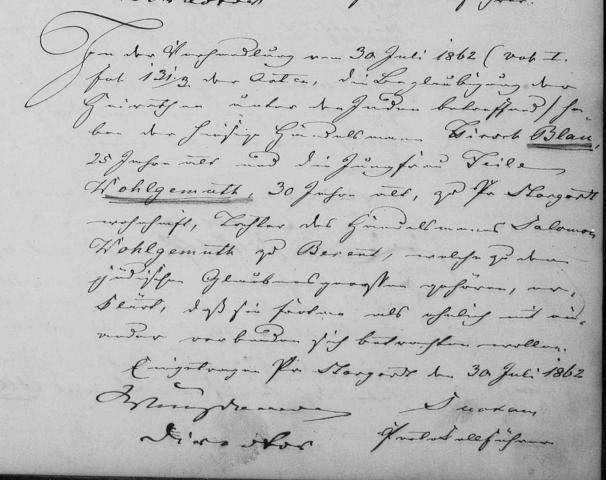 I have downloaded images of the most important records, and have entered the birth, marriage and death dates for all the descendants of Moses Wohlgemuth (born 1729), whom I consider to be the original Wohlgemuth. Actually I am not at all done with that work and there is much more to be learned about maternal family lines in particular. But I need to get back to work on my magazine assignment, so this is a good time to put out some highlights of my findings. "W" index page showing all Wohlgemuth deaths in Pr. Stargardt in order from 1847 to 1874. Some are our family members; others are not. Salomon (1763-1827) and wife Selme had a bunch of children, of whom two sons, Marcus and Raphael, had families. The daughters may have had families too, but these are harder to find. Anyway there are a number of Wohlgemuths in town who are descendants of Salomon. We are more interested in Herz. He and his wife Rose had three sons, one daughter who died at 13, and another who I haven’t tracked yet. The sons were Jacob, Abraham and Baruch, born between the years 1799 and 1809. Jacob and Abraham married sisters, Henriette and Rebecca Altmann. All three sons left children but we will focus here on Abraham’s branch. Abraham and Rebecca had two children who survived to adulthood. One was our GG grandfather Leopold, discussed further below. The other was a daughter Rose, with whom we see the first sign of intermarriage in the family. She went with her mother to Danzig after Abraham’s death in 1873, but the following year she married in Berlin to Salomon Razinski. The marriage record obtained by hint on Ancestry is from a collection of Lutheran records. I conjecture that Razinski was half-Jewish and raised as Christian. I’m not sure that being married in a Lutheran rite means that Rose necessarily converted. Leopold Wohlgemuth was born in 1833 and married in 1863 to Friederike Pächter from the town of Tiegenhof, across the Vistula River near to Elbing. They had a daughter and three sons, plus two children who died young. As usual, the daughter, another Rose or possibly Rosalie, is yet to be tracked. The sons were Isaac, Heinrich and Julius. Of the siblings, we already know a lot about Isaac’s family (Betty Katz, Elly and Hilda) and we recently learned about Julius’s only child, Leopold, who went to Brazil after the war. The interesting new one is Heinrich whom we did not know of until I recently found Aunt Hilda’s restitution affidavit. She says he was a banker in Danzig and I have more work to do to confirm that and find any family information about him. Leopold Wohlgemuth died fairly young at age 42 in 1876, It is possible but not proven that Friedericke moved her family to her Pächter family town, Tiegenhof, which could account for Isaac and Julius later entering business in Elbing. I now put aside my Wohlgemuth work for a few weeks while I work on other business. Here is an edited Google translation of the history of the Danzig Güterbahnhof as given in Encyklopedia Gdańska. See the original here. Also, enjoy these two images of the old station circa 1900. At top, a view from the southern entrance to the station. Below, freight is hauled to the terminal building by horse-drawn carts. 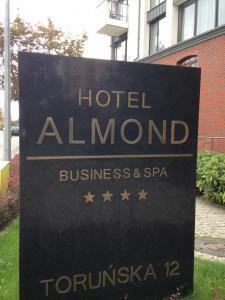 Location: Gdansk, Pomeranian Voivodeship, Poland. 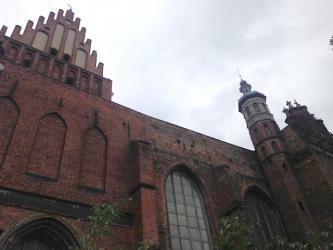 It was the first railway station in Gdansk and originally served as a passenger station. It’s quite unhappy location was caused by fortification regulations that covered all works within the surrounding embankments. 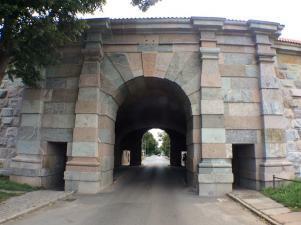 The Prussian military authorities reluctantly allowed only in the case of this station for a railway gate to be constructed. 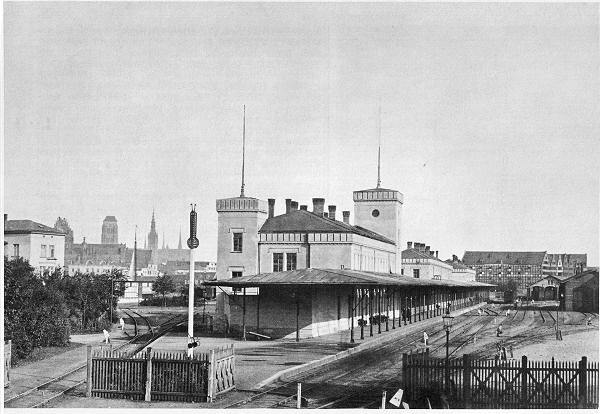 It later took on the role of a goods station after the new Danzig Hauptbahnhof (Main Gdańsk Station) was established. Thr Nizinna gate house was initially without a name, then referred to as Danzig Leege Tor, or Lowland Gate. The nearby station at Thornscherweg 10 (Toruńska Street) had several names—the Ostbahnhof or East Station, Güterbahnhof Leege Tor, Gdańsk South and, after 1945, Gdańsk-Kłodno. The first railway station in Gdańsk, it was built by the Prussian East Railway (Preußische Ostbahn) for servicing the branch from Tczew on the Berlin - Kostrzyn - Krzyż - Piła - Bydgoszcz - Tczew - Królewiec railway line. The location, distant from the city center, was forced by the military authorities, who allowed only to a small breach in the city fortifications near the Żubr bastion (south of Toruńska Street), creating a railway gate with shooting holes and recesses, which, if necessary, allowed for blocking the passage with iron bars. It was the final station for trains from Tczew (Dirschau). Designed as a leading station in the neo-Gothic style, it was a two-story building with a shed. It opened August 5, 1852; the interior was rebuilt in 1871-1872. In 1886, it got a horse-drawn tram connection with the Fish village; in 1884 a siding along the Spichlerzy was led from the station; and in 1893 a siding to the Meat Works at Englischer Damm (Angielska Grobla Street) was added. The station stopped accepting passenger trains on October 1, 1896; its function was taken over by the Central Station. From that time, he served only freight traffic. Reconstructed during World War I With offices for customs and customs clearance (Güter- und Zollabfertigungs-Gebäude). it also served temporarily as the Field Hospital of the Red Cross. In 1945, the building of the former passenger station was destroyed. After the war, it partly rebuilt and received transports with repatriates. Then it was used for the freight expedition (PKP, PSK) and the service of private railway shipments, including foreign traffic served by customs; baggage of persons going to emigrate was processed here. The servicing of the rolling stock was secured by a small engine house. The station was closed to rail traffic in 1995, and thereafter was rented by PKP for commercial operations. Wholesale operations were housed In two warehouse buildings, In 2007, the Bursztynek hostel was built in the renovated railway expedition building. In 2009, the area of the station property was put up for sale. 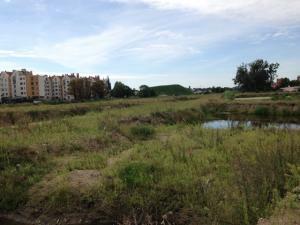 In September 2014, perpetual usufruct right to 5.5 hectares was acquired for 26.15 million PLN by the developer company Invest Komfort Spółka Kapitałowa (based in Gdynia). The dismantling of Warehouse buildings and the railway expedition building began in March 2015. Two residential buildings on the edge of the manor house were preserved. If you like maps, fire up your favorite geolocation tool and follow along as Isaak Wohlgemuth would have gone from home to work on a typical day in, say, 1908. 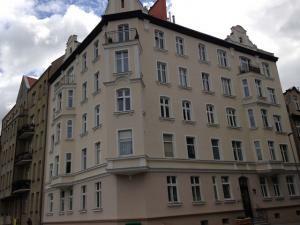 Put in a start location of Dobra 1A, Gdansk, Poland, the current address of Isaak’s former residence, where he lived with his wife Betty and their two daughters. The older girl is my grandmother, Elly Wohlgemuth Ringel, who is six years old as Isaak sets out on his walk. For the destination put in Zabi Kruk 11 in Gdansk. That’s my best guess for where the Wohlgemuth moving business was located, probably with a warehouse and stables. Ask for walking directions and look at the route in 3D satellite view so you get a feel for the terrain. The first discovery is a disappointment. 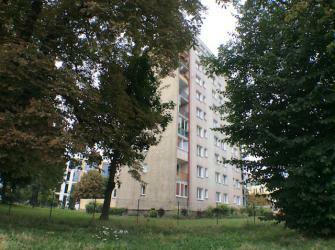 The building at Dobra 1–Abegg Gasse 1 in Isaak’s time–has been replaced with a particularly undistinguished postwar apartment building. The pictures show the current building and a nearby building from the period. Go across the first bridge and proceed along ul. Torunska (it was Thornscher Weg to Isaak). On your left is a big fenced off swampy vacant field. The photo gives a picture of the scene. 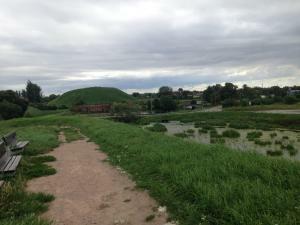 Beyond the field is a view of the southern ramparts of the old city. On the north side of the street alongside the canal is a major redevelopment project that looks like mixed use commercial and residential. There is a lot of new construction in and around Gdansk, but mostly it hasn’t yet touched this lower district of the old city. Cross the island on Torunska and try to imagine what it was like in Isaac’s day. But so far there is not much to go on. 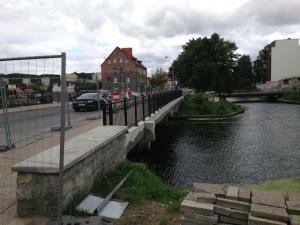 Proceed across the second bridge, past the luxury Almond Hotel and on to the corner of Zabi Kruk. In Isaak's day this street was called Poggenpfuhl, and we are looking for Poggenpfuhl 73. 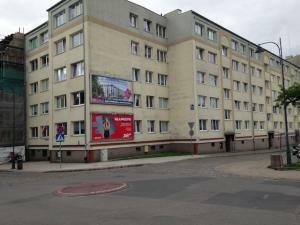 But the numbers on Zabi Kruk are entirely different, reaching no higher than number 20 on the south end of the street on a block is that is now dominated by three high-rise Soviet-era apartment buildings. You will check those out later, but for now you cross the street and go north on Zabi Kruk towards the big cathedral up ahead. This turns out to be the Church of St. Peter and Paul and it goes back to the 15th century. In front of the church is a historic information display that you stop to admire. The multimedia exhibit of photos and Polish text covers not the church specifically but the history of this part of the city, the Alte Vorstadt. On one of the panels describing the southern fortifications and the city’s Lower Gate, your eye is drawn to the finely drawn map. It is a detail of an 1840 map of the Alte Vorstadt showing all the key buildings and fortifications. That vacant field you noticed on the way over is shown on the map as the location of the "Güterbahnhof"—literally, a train station for goods, or freight depot. Ah, this makes sense! It explains why the Wohlgemuth shipping company was located in this section of town, remote from current-day transport hubs. With that insight, you can now return to the south end of Zabi Kruk, where those high rises have replaced the business block where the Wohlgemuth company was established. 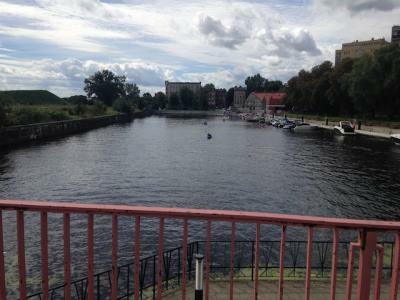 You go by the present-day boating concession on the channel, explore around the surviving buildings adjacent to the old rail yard, and come out at the lower gate to the city, called today the Brama Nizinna Tor once known as the Leege Thor. A former railroad right-of-way traverses a discrete opening in the surviving fortifications. Immediately above you is the imposing Żubr Bastion, one of 19 massive earthen mounds that surround the city. Zoom out on your mapping app to see the layout of the bastions. You will want to make your way up the trails to the top of the Żubr to enjoy the fantastic panorama. 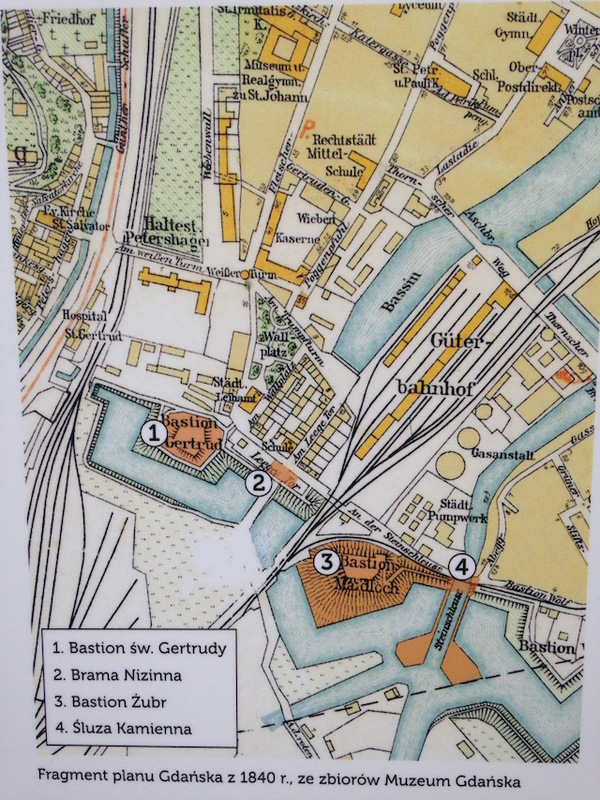 All of the sites called out on the 1840 map–the sluice gates, the Leege Thor, the Bahnhof, the approaches to the adjacent bastion–are all spread out below you. Cell service is spotty up here, so you are having trouble learning a lot about the train station in real time. From the name and what little is known in family lore, you can infer it had been a freight shipping terminal serving the old Prussian territories. Maybe it had been bombed out in the war and never rebuilt. The answers will come later when you can get back on line and spend some quality time with Google Translate. For now, enjoy the view and the pleasure of having discovered a little bit of history along the route of an ancestor’s walk to work. There are two recognizable Wohlgemuth headstone fragments in the old Jewish cemetery in Starogard Gdanski. I will talk about the other one in a separate post. Here is one where I couldn't exactly make out the first name and married name engraved on the stone, but I could clearly see her maiden name was Wohlgemuth. Her married name looked like Blau. It was great to find her but it didn't mean that much because I didn't know who she was or even what to call her. Since coming home I have been able to mine a new set of records that gives the answer. First, I knew pretty quickly I was right about the surname Blau. It is one of 64 Jewish family names that were registered in Stargardt in 1812. Then I began digging into the trove of digitized LDS microfilms that I just recently discovered. The whole family and all the relations are in there, including the answer to the identity of the Wohlgemuth-Blau gravestone. The third attachment is her marriage record from July 1862. I read her first name as Teile, which I find listed in at least one Yiddish name directory. She was the daughter of Salomon Wohlgemuth. As you recall, all of the Wohlgemuths in Stargard descended from either Salomon or, like us, his brother Herz. Teile's husband was Hirsch Blau. Salomon was already in his 60s when Teile was born in 1832. Apparently he was then residing in the nearby town of Berent, today Koscierzyna. I have not yet mined the death records so as of now I don't have death dates for Salomon or any of the others. I assume Salomon had several wives, so I can't say yet who Teile's mother was. Still I was able to identify and give a background story for the person in the grave at the Starogard Jewish cemetery. And that feels better than just having found the grave of an unidentified relative. I'll put out the important documents one by one as I capture them. 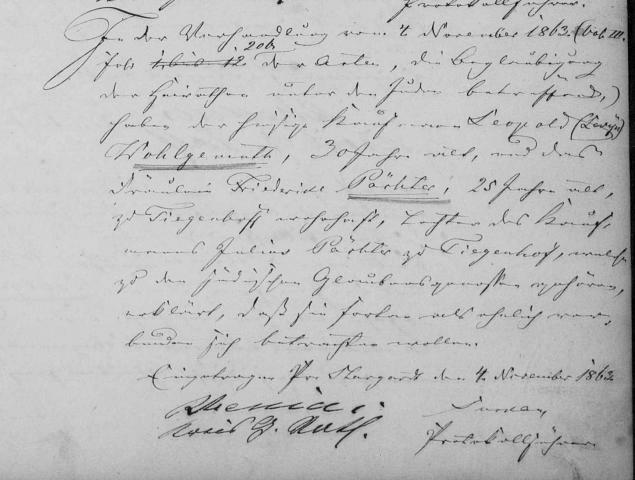 Here is the November 4, 1863 marriage record of Leopold Wohlgemuth and Fredericke Pächter, the future parents of Isaak and Julius Wohlgemuth. The record is in the lower right of the columnular book. I've cropped in on the Wohlgemuth record. You can see the two surnames that are underlined. I will extract the key information below. A few things are notable. We see again Leopold's common and Yiddish names both given. He has advanced in profession beyond dealer to merchant ("kaufmann"). Tiegenhof was a new location for me. It was the German name for the town now called Nowy Dvór Gdanski. It is 34 miles northeast of Starogard and is close to the bigger city of Elblag, formerly Elbing, where Isaak and Julius Wohlgemuth moved in 1892. Julius's name may be in honor of his father-in-law. I should try to learn more about the Pächter family in Tiegenhof. Leopold was born on March 5, 1833, the son of Abraham Wohgemuth and Rebecca (nee Altmann). He was formally give the name Lewin but the more Western name Leopold is also recorded on his birth record. Leopold's father Abraham Wohlgemuth was born in 1805, the third child of Herz Moses Wohlgemuth and Rosa. At the time of Abraham's birth, surnames were not yet in use, but a few years later in 1812 Herz Moses, his brother Salomon Moses, and their father Moses Salomon all adopted the Wohlgemuth surname. From a directory published in 1812 that correlates the surname with the old patronyms, we find birth dates for Hertz (March 16, 1769) and old man Moses (May 21, 1729). Herz's mother Yette was born March 13, 1739 and Moses married Yette on May 18, 1760. All of the men in the family are identified by profession as "handelsmann," or dealer. So that is our family history in Starogard Gdanski. I will capture images and properly document these new finds later, but I wanted to share the news immediately. Despite my best efforts, I was unable to resume daily posts during the three days remaining in my trip after the conference. It's a week later now, and I am home working through all my material including the missing days in Starogard and Gdansk. I am not going to try to recreate the immediacy of the daily reports but will highlight the most important developments, including both my on-site experience with further research accomplished since. 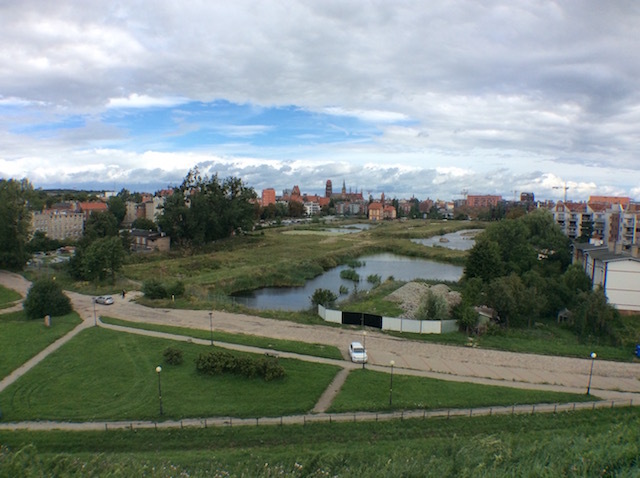 I am also working on a series of video-blogs from several locations on the trip, including reports from the Starogard Jewish cemetery and the lower city area of Gdansk. When I get those posted, you'll have an excellent idea of my daily experiences during the final leg of my trip. I'll start by posting several emails sent to family members during the last several days.